One of the major difficulties for the 2-liter, 4-cylinder SKYACTIV diesel motor has been heat buildup, which oddly enough is a problem that the rotaries also had back in the day when they ruled the track. 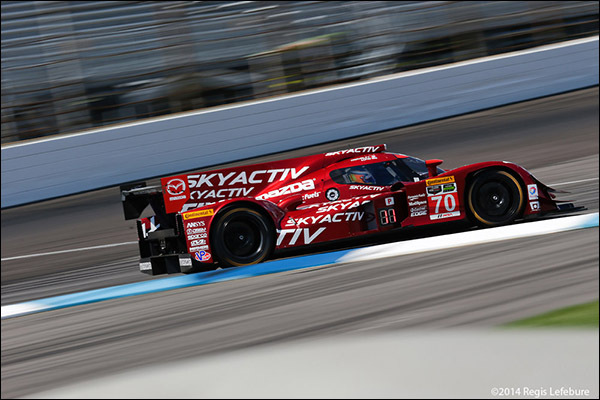 It is this heat buildup that has given the SKYACTIV motors reliability issues since they debuted last season. But due to constant development, the reliability is coming along rather nicely for what is a program that has been pushed from the Grand Am GX ranks to P2 in rather quick order. 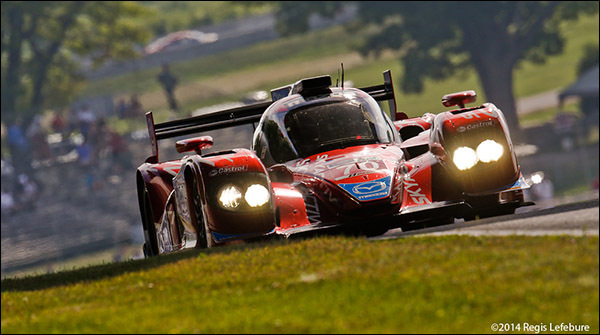 The GX entry was created as a way to give the SKYACTIV program an opportunity to race and effectively get a start, but unfortunately the merger between the Grand Am and the ALMS killed the class before it had a chance to grow out of a disappointing first season, entry wise. 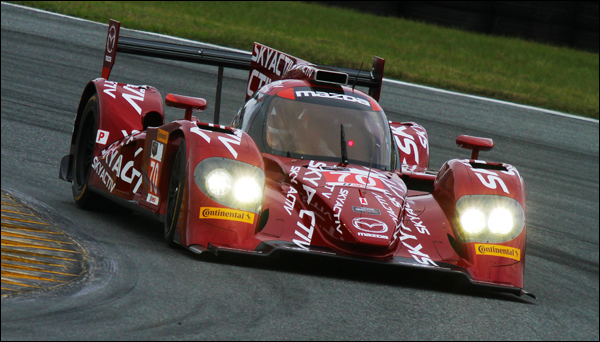 It also drastically hurt the chances Mazda had to make progress with the motor in the class before moving into P2. It effectively forced them into P2 earlier that they had intended. “In GX, we were racing with about 380 HP and to make the transition to P2, we were asking for 50 more HP right off the bat. We’re now up to 450 HP now, but we are still down on where we need to be,” according to Doonan. This season, modifications have helped, but Doonan said they have “not yet been able to turn up the boost yet. We have some off season upgrades planned, which should move us up the order, but we’re not sure it is enough.” In current tune, the Mazda has a 20-25 minute fuel efficiency advantage over the others in class, but you can be sure that once the power goes up, that advantage will be minimized. 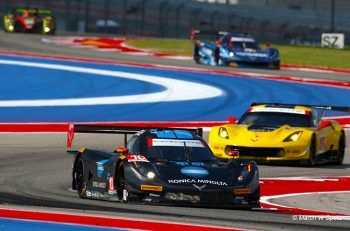 A problem that John faces is that while Mazda North America and also Japan support this effort, it still has a budget that is limited when compared to many in the sport. It is just part the market – Mazda is not as big of a company as who they are competing against, but they make do with what they’ve got. And make do better than anyone else in the sport. Mazda is already prominent in the amateur ranks of the sport, where they are proud to proclaim that “on any given weekend, there are more Mazdas on the road-race tracks of America than any other brand of vehicle”. They have a true grass-roots organization that supports racers all the way from Karting through to their “Road to Indy” program, as well as offering a very strong support network for the road racing contingent that races their production cars. 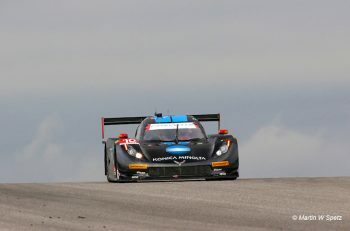 Looking back at the season so far, John said that the results at Mazda Raceway Laguna Seca were a big step forward as were the results at Canadian Tire Motorsport Park. “It was at these events that the progress has been really noticeable. We’re making steady progress and that is what we’re looking for.” John also added that the signing of Jeff Braun to the effort, starting at Detroit, is starting to pay dividends, some simply due to his wealth of experience. While this season has been one of catch up, Doonan expects to continue with the same package in 2015, only improved. There had been indications that Mazda intended to homologate the Lola chassis as a Mazda, but that will wait, likely until 2017, when the new regulations come on line for the P2 category.